Ruby is a 6 month old Saint Bernard puppy who is an absolute sweetheart. Her family are experienced dog owners, so they understand the importance of early training. 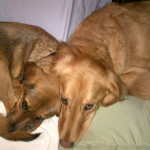 That’s why they contacted me for in-home dog training in Ossining NY. Every dog needs to learn how to walk nicely on-leash, “Come” when called, and “Stay” when their owners need them to. This is even more important with very large and strong breed dogs, such as a Saint Bernard. Wile Coyote’s owners were in need of a dog trainer who can help them develop reliable off-leash obedience training for their two dogs. 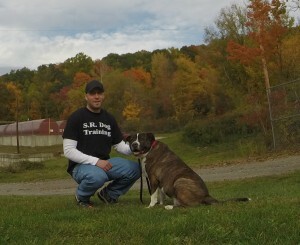 As a result, they contacted me for my premier in-home dog training in Ossining NY program. This particular family requested that I help them use a remote collar in order to create the most dependable off-leash recall (“Come”) command as possible. This means their dogs will “Come” when called, regardless of distractions and without having to rely on treats. I only use low level remote collar training as a communication tool in order to reinforce known commands, NEVER are punishment. This is very important to understand, as this is what separates me from many of the other trainers…I only use simple, safe, and effective dog training methods. Having a reliably obedient dog provides the dog more freedom, as they can now go more places with their family. It also enables owners to live relaxed and stress-free, without the worry of their dog not listening to them when out in public. The peace of mind in knowing their dog will listen is priceless. 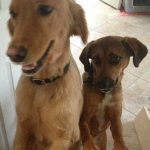 “We specifically contacted you regarding the need to train Guster and Wile Coyote (WC) to stay in our yard. We doubted before the training even began that WC could be trained to respond to the training since he is so distractible and inconsistent in his responses to commands. Guster learned fairly quickly to respond to the remote collar training. However, WC remained inconsistent. One of the most important lessons we learned from working with you is to know your dog and know yourself. Although you gave us all the tools to train both dogs, we were not willing to take the time and effort to make it work with WC. One of your most valued strengths is that you are able to provide alternatives for people to resolve the problems they are having with their pets. 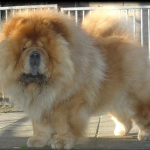 Asia is a three year old Chow Chow that loves her family but was not fond of strangers. Her owners were struggling with classical territorial based aggression. Asia was perfect with any member of her family or those she viewed as being in her “inner circle”. Her owners contacted me for help with dog training in Ossining NY, because Asia would display a different side of her personality when approached by strangers. Anytime Asia was approached by a person she did not know, she would begin barking, growling, and lunging. This behavior would take place wherever she thought her “territory” was – in the home, in her yard, or out on a walk in her neighborhood. Her owners were looking for a professional dog trainer in Ossining NY, so they contacted me for guidance. The first thing we did was determine that her aggression stemmed from territorial issues, not fear or dominance. From there, we came up with a behavior improvement and management plan that her owners understood and can implement. I always stress to puppy owners that it is essential to lay a proper foundation of rules, obedience training, and structure, in order to prevent issues from occurring later on in life. Many owners either do not do this, or even despite their best efforts, issues still arise. By using simple, safe, and effective dog training principles, we are able to improve upon an adult dog’s behavior issues. In doing so, it reduces stress and improves the quality of life for both dog and owner. Whether you are in need of adult dog training in Ossining NY or anywhere else, it is important to understand that dog training is a process which should be based on principles. In order for training to be both effective and fair to the dog, you cannot simply use harsh corrections or random training techniques. That is the main reason why I only use safe dog training principles that have been proven effective with all dogs, regardless of breed, age, or size.